2019 Carnival - Close to 2,000 carnival-goers braved the cold! 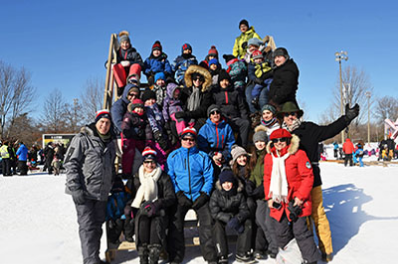 ROSEMÈRE, February 11, 2019 – This past Saturday, February 9, close to 2,000 participants braved the cold to take part in the 2019 edition of the Rosemère Winter Carnival. “I am delighted to note that, despite the winter wind and cold, residents turned out in large numbers for our traditional carnival. This event is a welcome opportunity for families and friends to come together in a festive outdoor ambience!” noted Rosemère mayor Eric Westram. Moreover, the Town’s elected officials donned their snowsuits and joined their fellow citizens for this celebration! Since Mother Nature presented particularly difficult conditions last Saturday, it was not possible to deploy a few inflatable structures on the site. “Children’s safety is a priority for us, and since the inflatables could have been swept up by the wind, we did not take any chances,” explained Mr. Westram. However, a number of participants chose to test their mettle against the obstacle course, inspired by military training, much to the pleasure of the young and young-at-heart. Among the new features introduced this year, we note the axe throw for children ages 12 and up as well the children’s circus workshop, which proved to be quite popular. Cardio Plein Air sessions, sleigh rides, the giant slide and skating rinks also added to the fun and got participants moving!